Here’s a project for you: place a black sheet of paper on a cookie sheet. Set the paper outdoors the next time it snows. Allow a few snowflakes to fall on the paper. Bring the cookie sheet indoors and look at the snowflakes through a magnifying lens. What do you see? That flat snowflake actually contains many tiny crystals. How do crystals form? Crystals occur in minerals and other chemical compounds, including sugar, salt and ice. In minerals, crystals are created when molten rock or dissolved minerals cool and become solid very slowly. The atoms in minerals cling to each other by electrical forces. As they stick together, they form three-dimensional patterns. 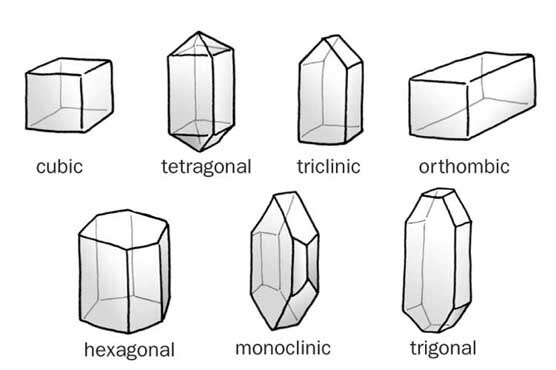 What Shapes Do Crystals Form? Cubic crystals, which resembles a box and has 6, 8 or even 12 sides. Hexagonal or trigonal crystals, which have six or three sides. Monoclinic crystals, which looks a bit like a multi-faced box. Orthorhombic crystals, which may look like two pyramids stuck together. Tetragonal crystals, which resemble a cube, but have one elongated side. Triclinic crystals, which may not be symmetrical. Crystallography is the scientific study of crystals and their formation. Gemstones, like rubies, emeralds and sapphires, are crystals. The elements they are made up of determine their color. A unit cell is what they call the basic building block of a crystal. It is the smallest arrangement of atoms that shows the crystal structure. The ions and atoms, or actually their charges, must equal zero. A crystal will not form if the positive and negative charges of its components are different. Some of the largest natural crystals in the world are found in the Cave of Crystals in Naica, Chihuahua, Mexico. The most common crystals you may be familiar with are table salt, snowflakes and pencil lead (graphite). Question: How do geodes form? Answer: When water in the Earth becomes hot enough to dissolve minerals in the rocks, the minerals are carried in the water where it seeps into cracks and holes in the rocks. When it cools, cavities filled with sparkling crystals form. These are geodes. 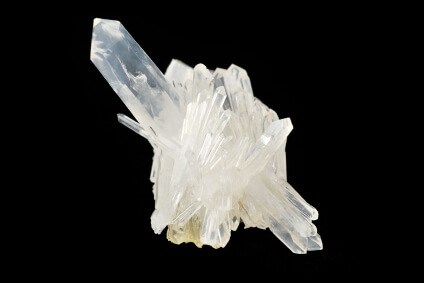 Enjoyed the Easy Earth Science for Kids Website about Crystals info? Take the FREE & fun Crystals quiz and download FREE all about Crystals worksheet for kids. For lengthy info click here. Declan, Tobin. " Fun Crystal Facts for Kids ." Easy Science for Kids, Apr 2019. Web. 26 Apr 2019. < https://easyscienceforkids.com/all-about-crystals/ >.